Tonight we are going to review another indigenous wine made of feteasca neagra grapes – Individo Feteasca Neagra 2015 from Château Vartely. 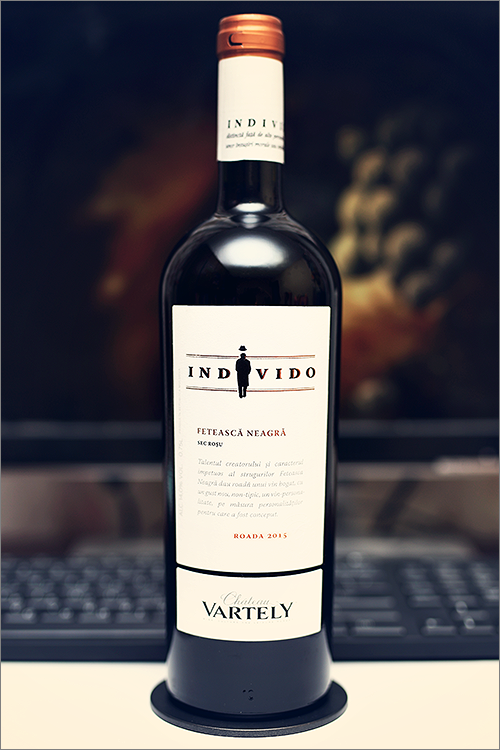 This wine is part of the ‘Individo‘ wine series, that is made of 6 wines, each with its own personality and character. Feteasca Neagra is an indigenous local variety and is not an easy grape to grow, because of its high vigour requires a lot of work in the vineyard and due to its thin skins it is susceptible to fungal diseases, especially powdery mildew. Despite all that, it is capable of producing wines of the highest quality with strong character and nuanced terrior, thus representing the region it was grown in. Deep garnet color, with bright ruby hues towards the rim of the glass. The nose is strong, filled mostly with black and red fruit flavours: red currant, black plum, blackcurrant, sour cherry, cherry tree wood, red apple, blackberry and red pepper. An instant later the nose is filled with notes of roasted oakwood, nutmeg, chocolate, black tea and some hints of roasted meat. The wine is dry, with high alcohol level, high acidity and firm tannin. It feels round, bitter and a bit tart and a bit wide, with a medium and lean body. This is a crisp, spicy and a bit smoky wine, as it tastes fruity, savory and earthy at the same time. The wine has a fair overall balance and a delicate meaty finish. It has a medium and a balanced, bitter-tart aftertaste. Conclusion: this wine is just several months away from its top form (6 to 12 months), as it feels too young at the moment, this is why we would advice for a bit more bottle ageing. It has overwhelming acidity and a bit rough tannins, which makes it the perfect pairing partner for any fat-rich, smoky or gamey meat dishes, like for example grilled pork ribs or venison steak. Also, due to its local origin, paring this wine with local cuisine may be even a better idea. Cheers!